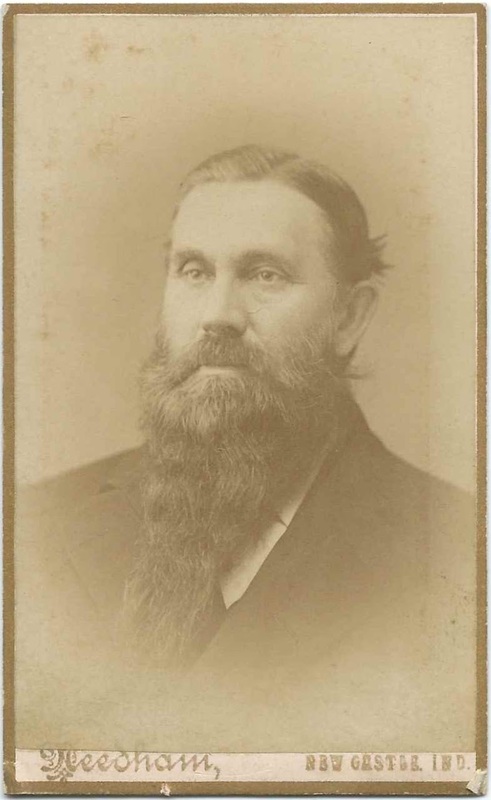 Cabinet photograph of a man identified as Rev. J. B. Ludwig. The photograph was taken at the Huddleston studio at New Castle, Indiana. Nothing on the reverse. 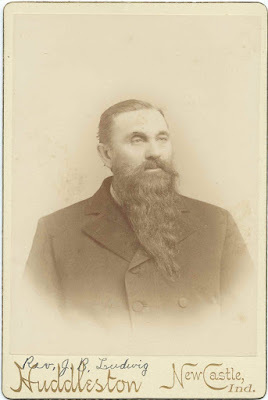 The cabinet photograph was found with a Carte de Visite of a man who also appears to be Rev. Ludwig. That photograph was also taken at the Huddleston studio. Nothing on the reverse. The History of Henry County, Indiana: Together with Sketches of Its Cities, Villages, and Towns ... Also a Condensed History of Indiana, Embracing Accounts of Pre-historic Races, Aborigines, Winnebago and Black Hawk Wars, and a Brief Review of Its Civil and Political History, published by the Inter-State Publishing Company in 1884, contains a biography of Rev. John B. Ludwig, below. 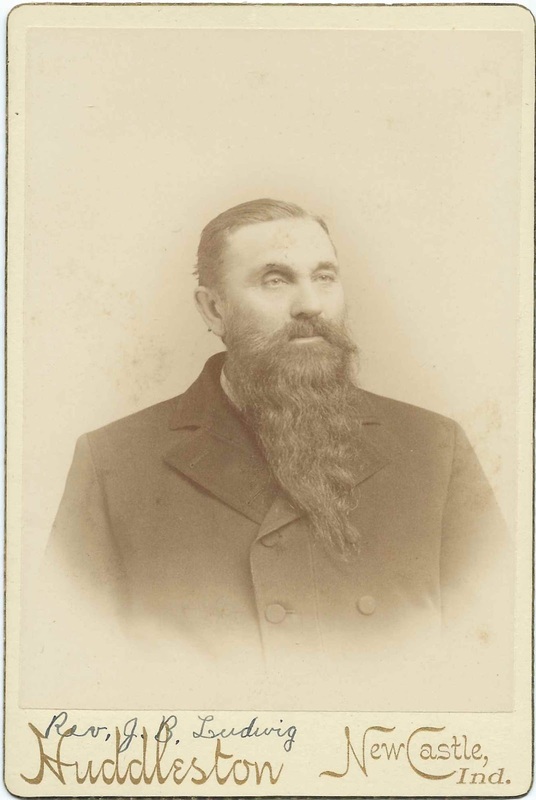 According to the above, John B. Ludwig was born at Waldoboro, Maine, on December 27, 1834 and started out his working life in the shipwright's trade. He moved to Indiana in 1854 and married Susan Jones of Madison, Indiana, in 1861. For the next several years, he preached and studied with Prof. Jno. C. Miller and in 1868 became the minister at the Christian church at Madison. He was a minister at New Castle, Indiana, from 1872 until 1876, when he had to resign because of ill health. He and Susan had four children, a son and three daughters. Waldoboro, Maine, was the site of the Moravian settlement at Broadbay, founded about 1760. Read about the Broadbay here and here. 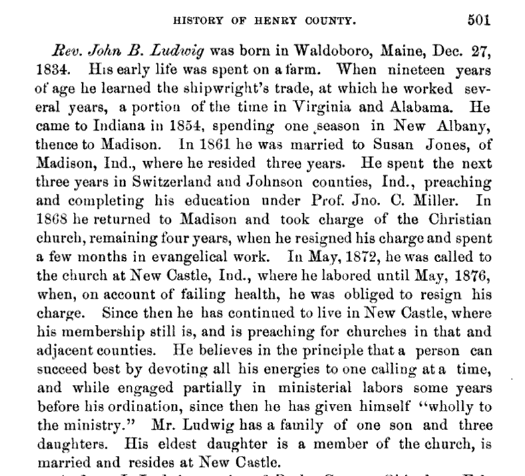 Interestingly, the Find a Grave listing for John Hall (1810-1879) buried at Newcomb Cemetery at Warren, Maine, notes that John B. Ludwig was John Hall's adopted son. I haven't yet found John B. Ludwig's birth parents. The 1860 Census of Warren, Maine, shows a John Ludwig living with the family of Peleg Rollins, a ship carpenter. John was also working as a ship carpenter, in fitting with the excerpt above. Rev. John B. Ludwig died June 15, 1895 at New Castle, Indiana. I believe the Susan Ludwig who died March 28, 1896 in Indiana, was John's widow. If you have corrections and/or additions to the information above, please leave a comment or contact me directly. Summit County, Ohio, Marriage Records, 1840-1980 [of Carrie Edna Ludwig, daughter of John B. Ludwig and Susan (Jones) Ludwig.